At least 38 people have been killed in Kenya's Rift Valley after a dam collapsed following weeks of torrential rain, which has also forced hundreds from their homes. Water reportedly burst through the banks of the Patel Dam in Nakuru County on Wednesday night, washing away hundreds of homes. Around 38 bodies have been recovered and many people are reported missing. About 40 people, who were rescued from the disaster-hit region, have been taken to hospital today morning. According to officials, water and mud spewed out of the reservoir submerged homes over a radius of nearly two kilometres. Many are feared trapped. Since March, at least 132 people have died and more than 225,000 displaced due to floods caused by seasonal rains, according to a government statement. Military helicopters have been conducting recce for the past week to rescue people marooned due to flooding. In fact, torrential rains have wreaked havoc in the last few weeks, destroying thousands of homes and displacing more than half a million people across East Africa. Curiously enough, the worst-hit countries—Somalia, Kenya and Ethiopia—were just recovering from a devastating drought, exacerbated by El Nino. Decline in crop production led to spike in food prices and put a strain on economic growth. In Kenya, flooding has affected 211,000 people in North East Region, Coastal Region, Rift Valley, Nyanza and large urban areas. It has displaced over 260,000 people, displaced between 225-436 people and killed at least 132 people. It has not only damaged businesses and swept away homes, but also destroyed community water points, increasing chances of disease outbreaks, including cholera and malaria. Tana River, Garissa, Kilifi, Kisumu, Mandera, Isiolo, Turkana, Marsabit, Makueni, and Kitui were among the 15 hardest hit counties. In a hard blow to food production, the ravaging floods have destroyed over 21,000 acres (8,500 hectares) of crops and killed about 20,000 animals. According to the latest forecast by the Kenya Meteorological Department, “for the next seven days (May 8-14), several areas within the Lake Victoria Basin, Western, Central and South Rift Valley, Central (including Nairobi ) & Coast are expected to continue receiving rainfall”. 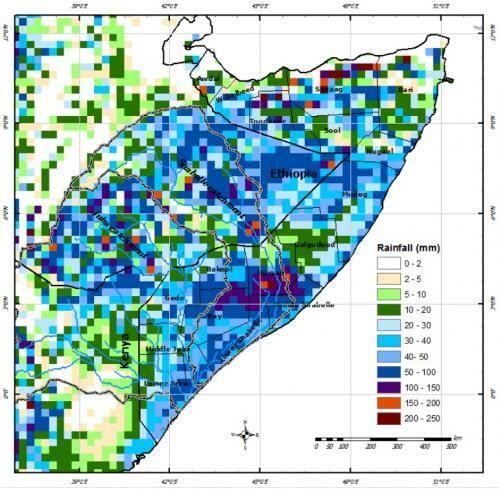 In Somalia, the flooding has already affected 700,000 people in Beletwenye, Hiiran, Hirshabelle, Baidoa, Lower Shabelle and South West State. A national emergency has been declared, with the government asking for international assistance, and pushing humanitarian agencies to relocate hundreds of people to safer grounds. 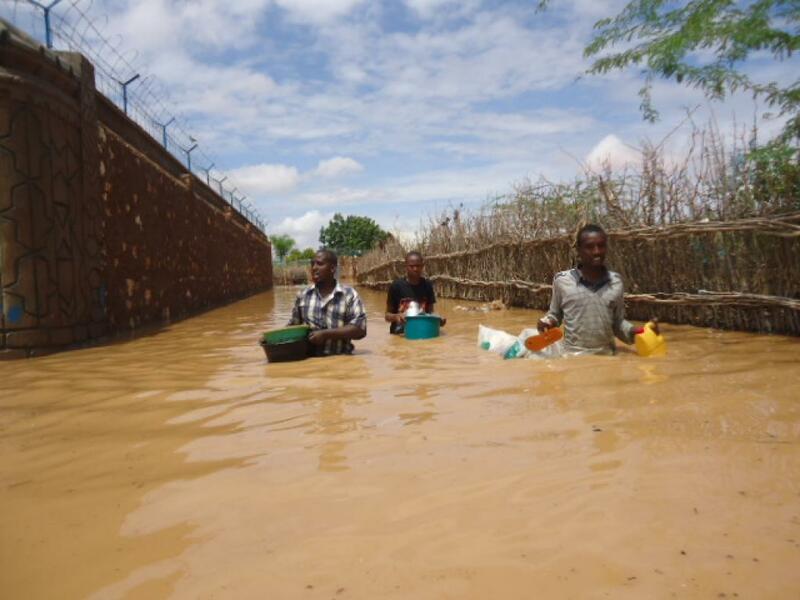 Juba and Shabelle—Somalia’s two major rivers—have reportedly burst their banks in several locations, causing flooding much earlier in the season than ever before. According to the UN Food and Agriculture Organization (FAO), the current floods are some of the worst the region has ever seen. 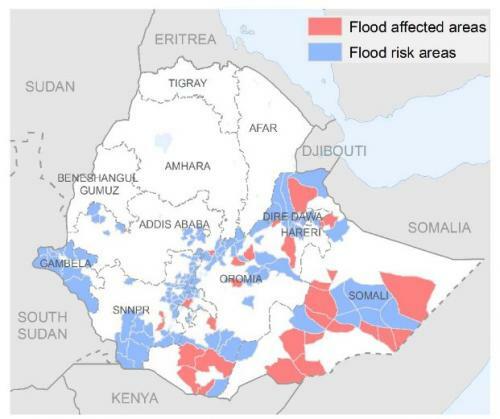 In Ethiopia, 165,000 are affected by flash floods in the Somali region. Key infrastructure such as roads and airports have been damaged or destroyed in all three countries. Going by the meteorological records, rainfall in the first week of May strengthened, especially over the southern parts of the nation. Flooding due to weather patterns is typically a predictable event, whether seasonal or otherwise. Disasters from flooding arising from natural phenomenon such as torrential rain is preventable through proper community planning, construction methods, and resiliency plans. Dam failure is a preventable event through engineering design, construction quality control, regular inspection and timely maintenance. While disaster mitigation is often viewed as a national issue, implementation is more often local. Resiliency plans and community planning start in the local community/region while national response and mitigation policy typically are initiated at the upper government levels. Regardless, there is little excuse for a flood disaster to occur.